About: The Kenton is a Norwegian-run, friendly neighbourhood-pub that offers great wines, beers, ales, and cocktails. We are serving a fine selection of food including everyones favourite filler, pie & mash, from our friends ‘Pieminister’, cheese and meat boards, plus an immense Roast on Sundays. The Kenton’s location on the divide between Hackney Wick and Victoria Park means that it has to work harder than most to charm people with its Anglo-Scandi style. Part of that means one of the largest roast dinners in London, at one of the most reasonable prices. In addition, service is warm, the people are a mixed bag and there’s always good music. "if you can’t find something in the Kenton to love then you’re way too hard to please"
To say this Hackney pub has a lot going on would be a huge understatement, unless events on almost every night of the week is the norm to you? Located at the top of Morning Lane if you’re stumbling across it then chances are you’re on your way to Victoria Park, in which case you should stop in and take the weight off a while. It’s a surprise to find such a great pub in this neck of the woods and beyond its good-looking exterior there are interior treats too. The main bar is a mixture of sanded wood and traditional tables and chairs and every direction provides something to look at, whether it’s the mounted animal heads, art splashed skateboards or framed records. Then there’s the back room, which is utilized for book clubs, film nights and all sorts of DIY fun. It’s completed by its back yard - a sizeable space with benches and a roofed shed to enjoy the air whether rain or shine. Famed for its Sunday roast – it’s huge – the Kenton also promotes itself with excellent DJs, jumble sales, cocktail nights, live music, quizzes and rock ‘n’ roll bingo! That’s a lot going on. The list of beers is worthy of a mention too and in the end if you can’t find something in the Kenton to love then you’re way too hard to please. Hands down, the biggest roast I've had in London - and tasty too. 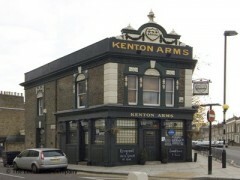 The Kenton is a lovely pub in an area of Hackney that means it will probably always remain a bit of a gem.